I would like to invite anyone and everyone to participate in my second annual Labor Day blogathon running September 6 - 12. Last year's De Palma Blogathon was such a resounding success, I hope to make this an annual tradition, a transition from the commercial summer movie season into the start of the (hopefully) art-centered fall season. This year's featured director is David Cronenberg. The Canadian auteur has evolved quite a bit from his early days pioneering the "body horror" subgenre to become a recognized auteur focused more on the turmoil within. Like last year, I would like to make the blog a destination in order to give every submission a democratic opportunity to be read. 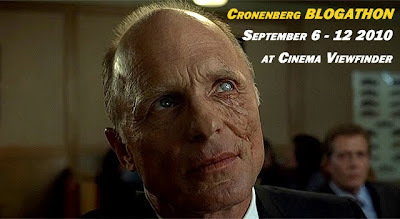 I'd be happy to publish links to any previously published Cronenberg posts. But if you write a new piece, I hope you'll allow me to publish it here first before you cross post it on your own site. Send your contributions here, please. I am happy to accept entries from anyone. Unfortunately, I don't have e-mails for everyone whose blog I read. So in the interest of getting the word out, if you choose not to submit a piece, I request that you please help me promote this event at your own respective sites. At top and below are JPEGs to help you in marketing this. Please link any JPEG you display to this post. I hope to have all of you participate in some way. Great Tony, was planning something of this kind myself. I already have one on The Brood, you want me to submit that. Also, can i give the post, with a Disclaimer stating that it has already been published at X site. Fantastic. I'm in. Videodrome hooked me on Cronenberg and I've been meaning to watch Dead Ringers and to revisit Eastern Promises. I reviewed Crash too recently to add much to it, dearly as I love it, but those two were already high on my list. ...okay. Sorry about that. This is a great idea. I recently just watched RABID, THE BROOD, and VIDEODROME...I will gladly write about any one of those...or perhaps I'll work on something about my favorite Cronenberg from the 80's: THE FLY. I'm assuming a lot of people will cover the recent stuff, so I'll stick with his horror/sci-fi era since that's what I've been immersed in lately. This is a great idea, Tony! This is great. I'll be promoting this on my blog immediately. I have no idea what to write about, though. You know me--I love writing about the little-seen, little talked about films; and yet most of Cronenberg's output is pretty popular. It'll be tough to find a title that hasn't already been extensively reviewed. How about M. Butterfly? I've never seen it, but if nobody's going to claim a piece on that one I might think about seeing it and then writing up on it. I know it was one of Cronenberg's worst-received films but I suspect I could find some merit in it. Glad to have you on board again for this year's Blogathon. I'd welcome any new piece, but do send me the link for any previously published reviews as we get closer to the blogathon. I'm going to compile those links and devote a whole post to them. I look forward to any posts you may come up with. Here's an odd one from Cronenberg: 1979's FAST COMPANY. Betcha no one's going to write about this drag racing flick. Tony, i have seen Fast Company. Pretty much a B flick, can write about it. I guess being in India, has it's merits, you end up watching all these kinda B flicks, LOL. I wrote up "Stereo" and "Crimes of the Future" a while back. Any chance I can submit, or at least provide a link to that article? Excellent...banner has been added to Moon in the Gutter's page and I will try and get a new article for you. Or, at the very least, I will beef up one of my older pieces. Great idea! Now this is a director who will give cause for some cerebral discourse. Tony - great pick for this year, and I can't wait to participate again. I don't recall that we laid claims to films beforehand last year - do we need to this time around? Feel free to send some links as we get closer to the blogathon date. Submissions are open to anybody and everybody. Feel free to write anything you'd like, positive or negative, about any Cronenbergian thing you'd like. That even includes his acting in films like NIGHTBREED, etc., or his TV credits like FRIDAY THE 13TH: THE SERIES. Count me in! I love Cronenberg and as a fellow Canadian I am totally down with paying tribute to his impressive body of work. I plan to tackle NAKED LUNCH. oh an M. BUTTERFLY is a real good movie, to whomever plans on covering it. Thanks for joining in, J.D. Jamie, although those are some good ideas, I'd like to stick strictly to Cronenberg. He's prolific enough that adding any other "body horror" films would make this blogathon a bit unwieldy. Now if you want to compare one of those films to C's oeuvre, or if you want to cover the short film you proposed, that would be fine. I'll try, but honestly, I'm not familiar with many Cronenberg movies. I loook forward to your contributions, Edgar. And Simon, this isn't an exam. Enjoy the contributions by others if you don't feel up to speed on Cronenberg's films. I'm in! It sounds great. I'll post about the 'thon this week and have an entry ready for the main event. Still kicking around some ideas. I'm leaning towards another video piece though it would be a bit more casual/lighter than last year (maybe even a straight-up music video with images from one or more of his films...). Looking forward to it all - will you be closing off the blogathon again this year with your own post? I loved your Scarface/Carlito one in '09. I'd love to see another video piece, MovieMan. As for my piece, I will have at least one new piece (in addition to a link back to one I did last year on THE BROOD). I'm not sure I'll close with that one. That was more out of procrastination. Haven't figured out what film, yet. I'm just stumbling onto your blog...following links around the net like I always do. What a great idea! I would be really happy to write a piece if there are still openings. And I would really like to cover Crash. I haven't seen it since it was first released. I'd be curious to see how it looks to an older set of eyes. I'll try e-mailing you too. Hey Dusty, I got your email. Sorry it's taken so long to respond. Feel free to write about any movie you wish, CRASH included. Your post can be of any length, and you can send it to me whenever you wish. Thanks for checking out my blog, and I promise to do the same with yours. Very cool, man! Crash seems like a good contender. It was insanely powerful (before I was old and jaded). That piece will coming your way, my friend! And here's a link to playground of doom. I'm a new born baby into blogging, so there's not too many posts. Aunque me gustaría leer un artículo en español, ya que es mi primer idioma, mi público está compuesto principalmente de americanos y ingleses. Así, mientras salpicando un poco de español o "spanglish" está bien, debe ser escrito en inglés. Si va...nos fajaremos con el inglés. Es la primera vez que participo en esto, cómo es la cuestión? Una película por día? Son todas las películas? Escriba tantos artículos como desee. Muchos escriben sólo uno. Ud. puede escribir sobre su obra completa o sólo una película, o hasta sólo una escena. This is a great idea and I'm really happy I discovered your blog! I'll be sure to submit some of my own work, as I did a huge Cronenberg marathon back in May! I'm looking forward to this! I guess I've come in a bit late. Anyway, wanted to let you know, I think this is a great idea, and I too am greatly interested in sending in my reviews of the Cronenberg films that I've reviewed at my blog, and will mail you the links soon. Tony -- I've been super busy lately, so I'm just now getting around to noticing that this is going on THIS week. I always have thoughts to contribute to these kinds of things, and as it turns out I have a Cronenberg I'll be writing about for the Wonders In The Dark horror countdown that should be up on my site by weeks end. I'll be sure to link to your series of posts here when it goes up. Hey Tony, I'll have mine up and sent to you by tonight. Huge Cronenberg fan here, and I'll work up a piece on eXistenZ to send your way in the next couple of days. Just a fairly basic review, but I'll see how it turns out. wow, I have been going through my own mini Cronenberg festival for the last few weeks. I will DEFINITELY be contributing!